This content is for 6 Month Membership, 1 Month Membership, 12 Month Membership, 24 Month Membership and 3 Month Membership members only. Sam has created some fantastic resources that save our department a lot of time. Our students are finding the revision site very useful in the run up to their exams. The quick quizzes are great and the flashcards are proving to be extremely valuable. My students are using it and love it. Sam who runs the site is very supportive and will adapt and listen to suggestions! Online note making facility, flash cards and self marking quizzes with instant feedback! Cannot praise ReviseComputerScience.com enough. Invaluable resource for my students. Love the format and the interactive quizzes. Students really enjoy working through the topics and it’s suitable for all levels. Great resource at a great price. Update your profile and change your password here! 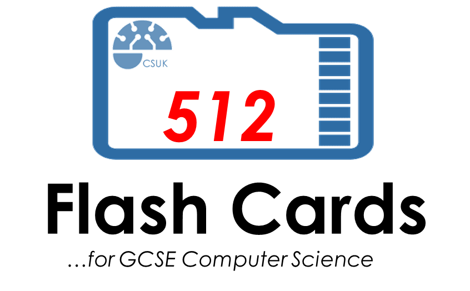 …you can purchase all 512 Flash Cards, with a site licence, by clicking on the image below! This will allow you to print, photocopy and share these flashcards with your students, year after year! Copyright © 2019 Revise Computer Science. Powered by WordPress. Theme: Spacious by ThemeGrill.